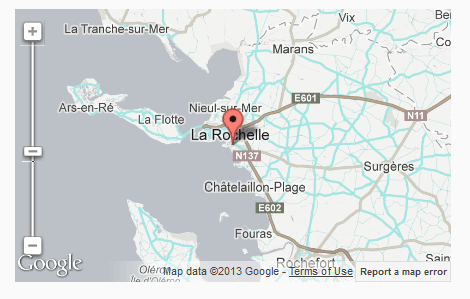 The Google Map element allows you to show a Google Map appropriate for the record e.g. to show a customer's address on a map. If you want to use geocode you must also enable Google Maps Geocoding API. NOTE that certain advanced features, like geocoding and radius widgets, currently will not work if the map is in a repeated group. We are gradually working on making all of the map element features "repeat friendly", but you should test any specific features your app may rely on before committing to your app design. Style - Determines optional styling that can be applied to the map e.g. 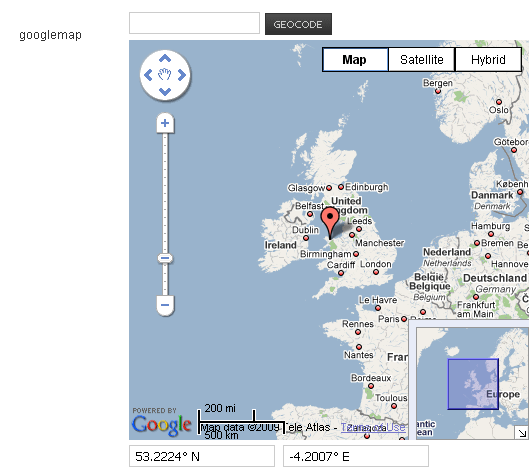 Google provides a Google Map style generator which may help you in setting up the style properties. 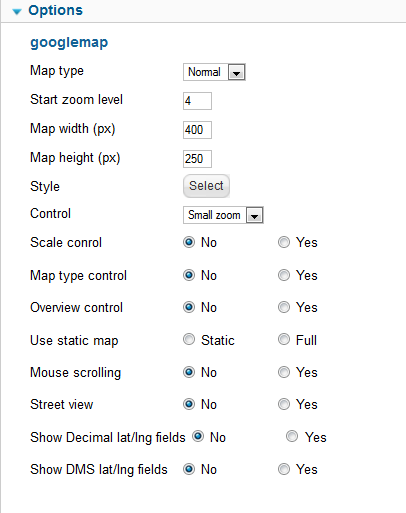 Use static map- if the map is in a detailed view, then this option determines how to render the map. Full - The normal Google map is shown, but the marker can not be moved. Mouse scrolling - If set to yes, then moving the mouse over the map and using its scroll wheel will scroll the map in/out. Show Decimal lat/lng fields - If set to yes show the markers lat/lng location in two fields underneath the map. Show DMS lat/lng fields - If set to yes show the markers lat/lng fields containing the degrees minutes seconds. 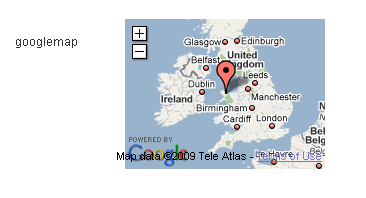 Users location - Asks the user if they want to use their current location. When using Chrome you must be accessing the website using a secure link - i.e. https://. Chrome does not allow sharing of information on to non-secure websites. This behavior is the same on Android and Windows. Default lat - default latitude when adding a new record. Geocoding is the process of looking up a lat/lng location from a given address. 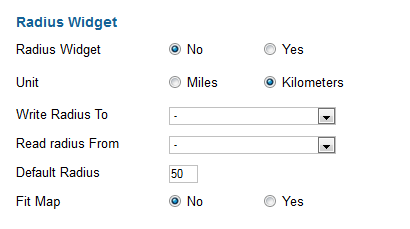 Yes - Enable this feature, a field will be placed above the map. The address typed in here will be used as the geocode address. 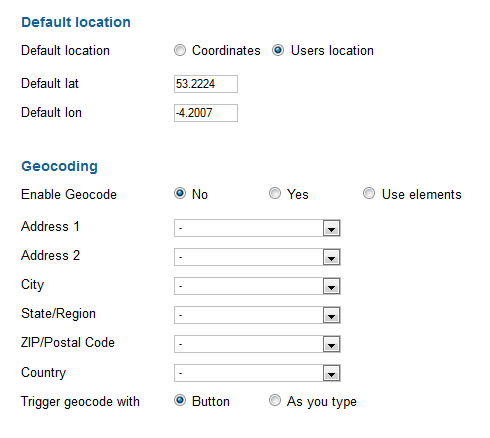 Use Elements - Geocoding will be turned on but will use the data entered in the elements selected below to geocode the address. Address 1 ... Country - Select the elements you want to use to geocode the address from. Used when enable geocoding = use elements. As you type - An ajax request is sent to trigger the geocode lookup each time text in one of the geocode fields is changed. Read radius from - lement to watch and update the Radius Widget from when changed. Can be the same as Write Radius To element. Default radius - If not using read or write elements, default distance for Radius Widget. If using elements, Read element value will be used in preference to Write element value. 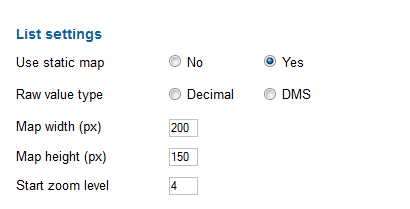 Raw value type - If use static map is no then show the location as decimal value or as degrees minutes and seconds. In certain circumstances, for instance when using tabbed or popup layouts, the map will not display correctly if it was not visible when the page was loaded. 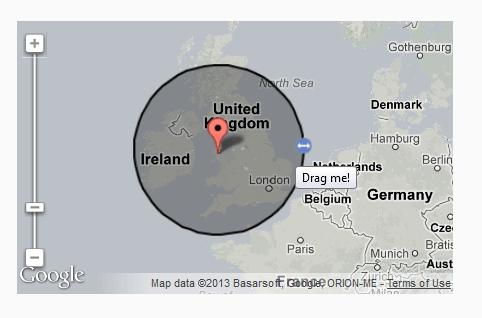 This is a known issue with Google maps, and not really a Fabrik "bug". For Fabrik's built in popup and tabbed displays, this is handled automatically. But if you are using your own custom ways of putting the form in a popup or a tab, and it isn't visible on the page when the page is first loaded, you will have to handle redrawing the map when it is displayed. Here is an example of doing this for the UIKit framework, which fires an event (uk.modal.show) when it opens a modal dialog. So we need to hang some event handling code on that. In this case, we are using jQuery code to do it. In this case, the #your_uk_modal_div is the ID of the container which has the uk-modal class, in which your modal content (incuding the Fabrik form) is located. You would simply replace that ID with your div's ID, replace 123 in the form_123 with your form's numeric ID, and yourtable___yourmap with the full element name of your map element. The fconsole() line is just for debugging purposes, so you can see in a debug console when the event fires, you can delete that once the code is working. Most tabbing and modal plugins or frameworks provide this feature, of firing an event or a callback function when the tab is selected or the modal is opened. It's just a case of working out how to utilize them, and run that one line of code that runs the redraw() on the map.